Most tourists heading to Phuket head straight for the beaches. And that’s understandable. 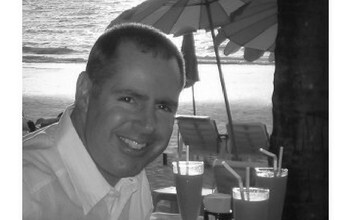 But Phuket Town has much to offer and can be an excellent base to explore the rest of the island. 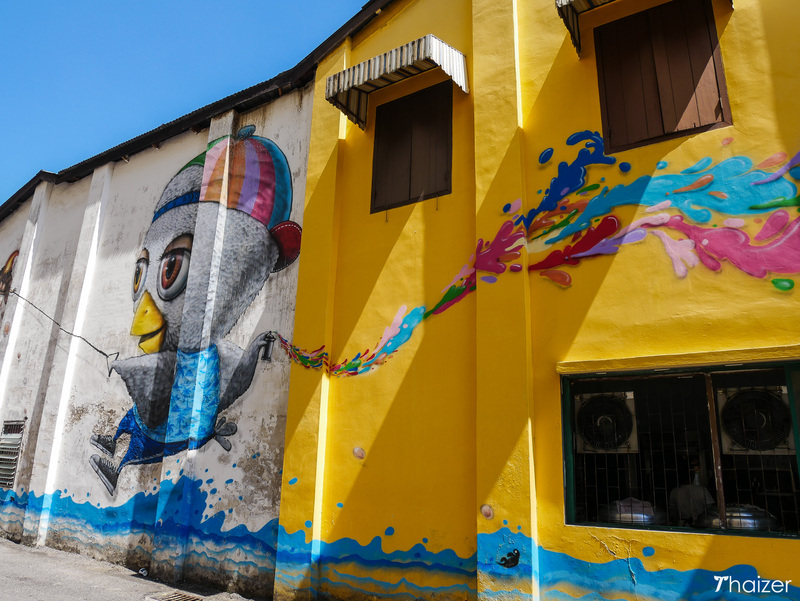 Although the west coast beaches may be an hour away, that is countered by the fact that Phuket Town is home to some wonderful restaurants, charming cafes and elegantly restored heritage buildings. 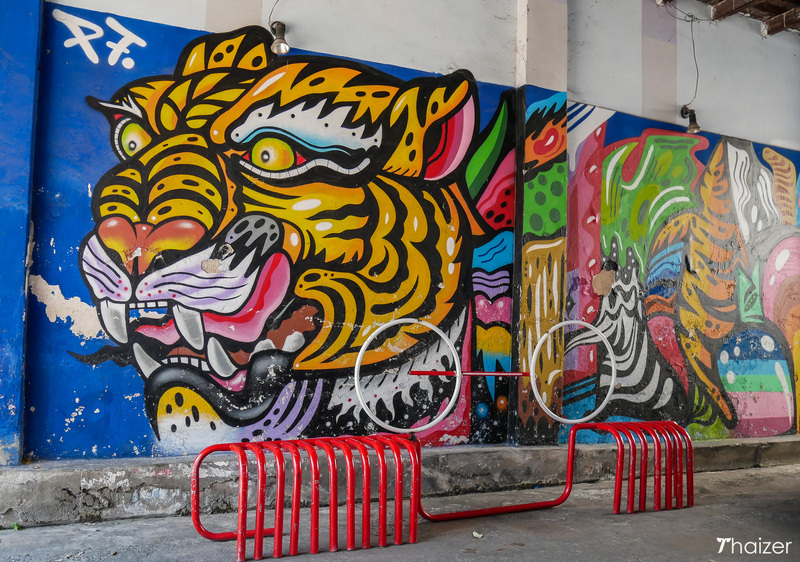 It’s also where you’ll find vibrant street art that celebrates the culture and diversity of Phuket and its food. In late 2015, Phuket became a UNESCO Creative City of Gastronomy. 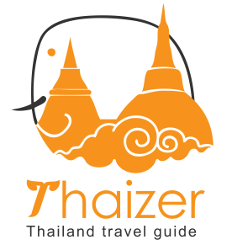 The listing recognises the unique local food of Phuket with its rich mix of influences drawn from Thailand, China and Malaysia. In response to the award, the FAT (Food Art Town) Phuket initiative was established in 2016. 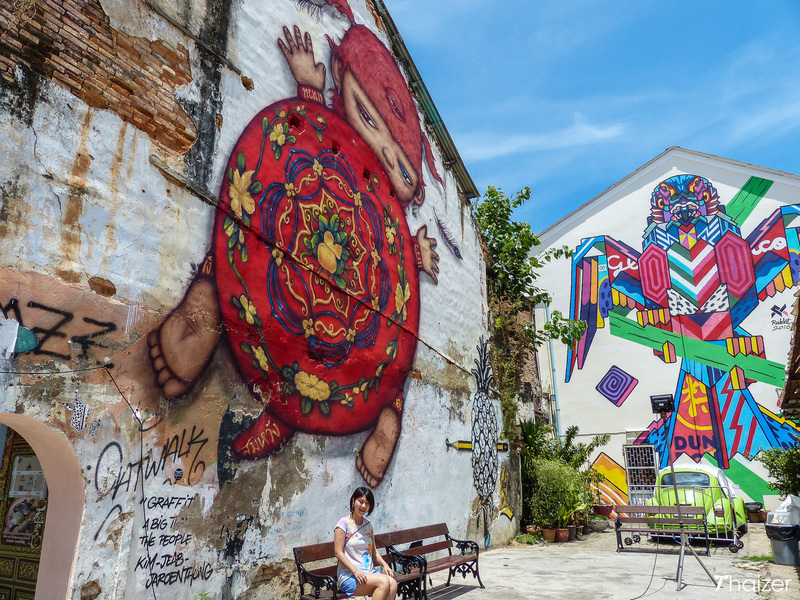 Under the umbrella name ‘So Phuket’, 12 talented graffiti artists collaborated on a series of murals to highlight the food and local lifestyle of the islanders. The project wasn’t without controversy, with the group forced to remove one mural from the wall of a museum following local objections. 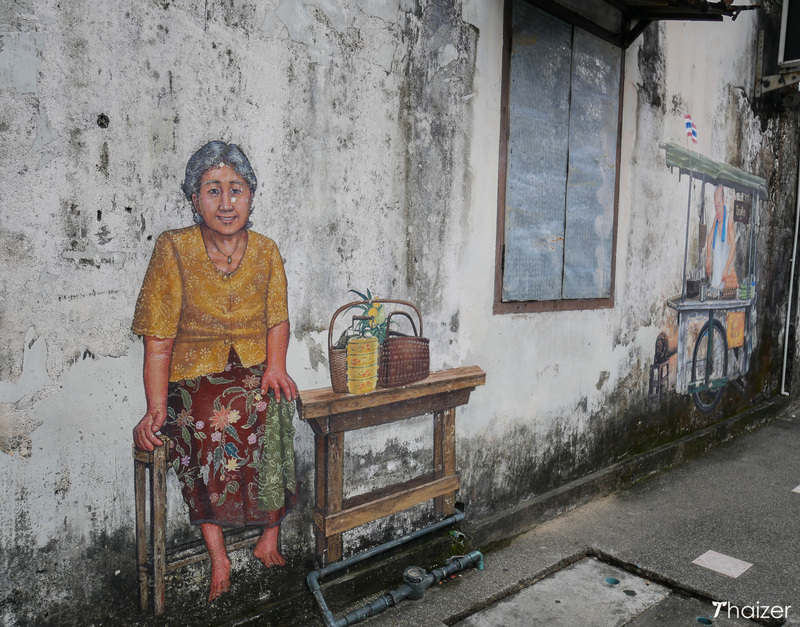 But for the most part, the street art has been positively received by Phuket residents and tourists. During the 19th century many Chinese immigrants arrived in Phuket to work in the tin mining industry. Their descendants born in Phuket became known as Peranakan, Straits Chinese or Baba. Generations later these descandants are proudly Thai, but continue to maintain their own Baba traditions too. Phuket Baba food combines a mix of culinary styles with influences from Thai, Hokkien Chinese and Malay cuisine. 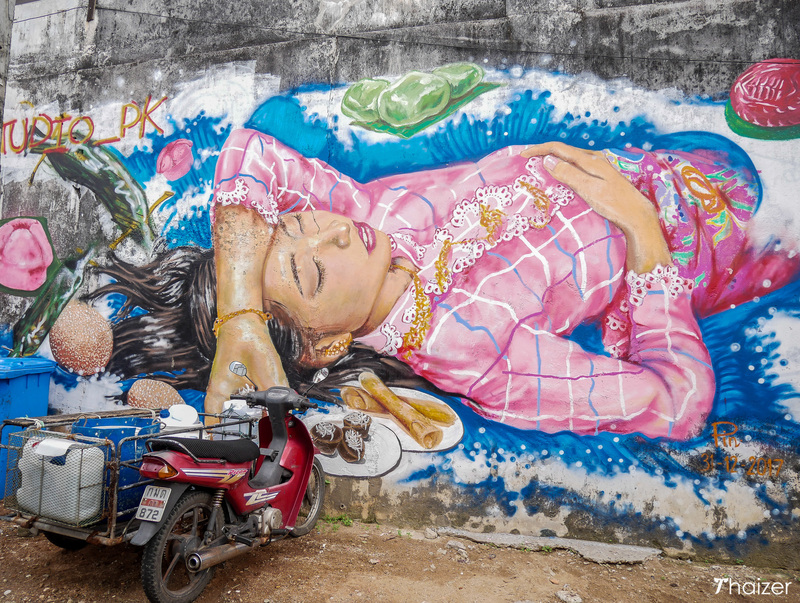 With its striking design and prominent location at the junction of Romanee Road and Thalang Road, this mural by Thai artist Alex Face is probably one of the most photographed spots in Phuket Town. The artist’s signature character, known as Mardi, has been incorporated into Ang Ku, a sweet treat that forms the shape of a red turtle and is a popular snack during the Phor Tor Hungry Ghost Festival. The mural also features auspicious Chinese words on the ankles, wrists and tail of the turtle. Thai artist Patcharapol Tangreun, also known as Alex Face, is famous for his work which features a child-like character wearing animal costumes. Patcharapol believes in the spirit and that it can be felt but not seen with our own two eyes. He draws the third eye on his character, called Mardi, to represent anther dimension and to see beyond the human eye. The geometric design of this colourful bird depicts favourite sweets and desserts from a bygone era. 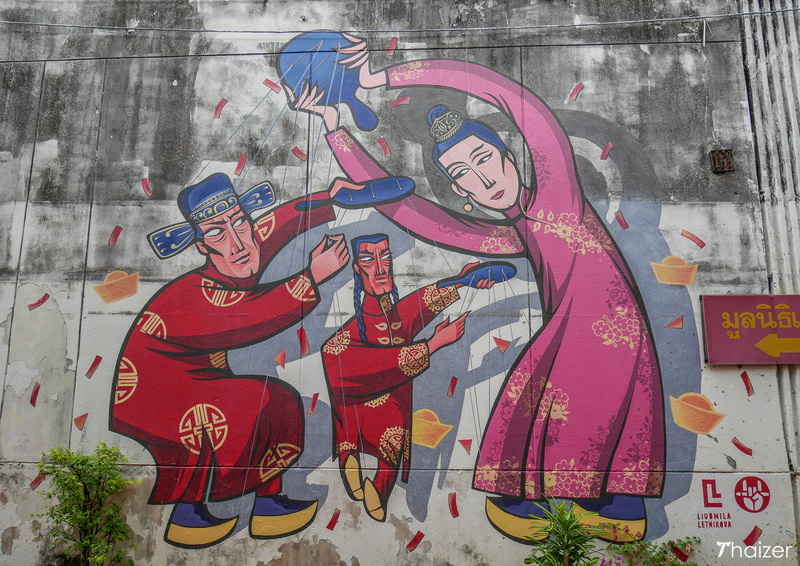 There are said to be a dozen snacks hidden in the mural which represents childhood memories and conjures up images of traditional Phuket Hokkien-Style khanom or sweets. And if you are in Phuket Town and want to sample some of these desserts, pay a visit to Kengtin where the locals shop. 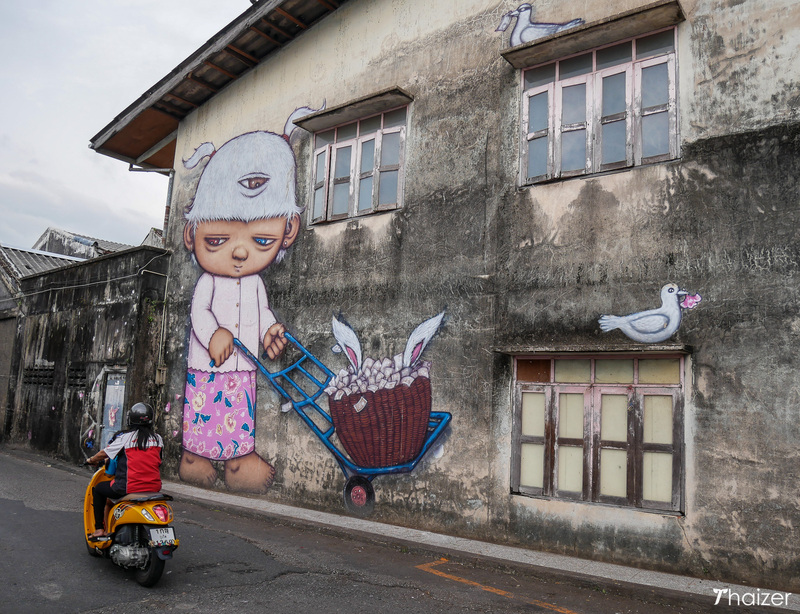 Another work from Alex Face features his character Mardi at Phuket’s Downtown Market. Mardi is shown wearing a pink Baba dress and pushing a market trader’s trolley with a basket full of money with another pair of ears poking out from the top. The market setting is a popular location for breakfast which in Phuket can be a range of foods including roti, curry, noodles or dim sum. This simple, but effective painting depicts a Phuket ‘auntie’, a middle-aged lady in her home kitchen. 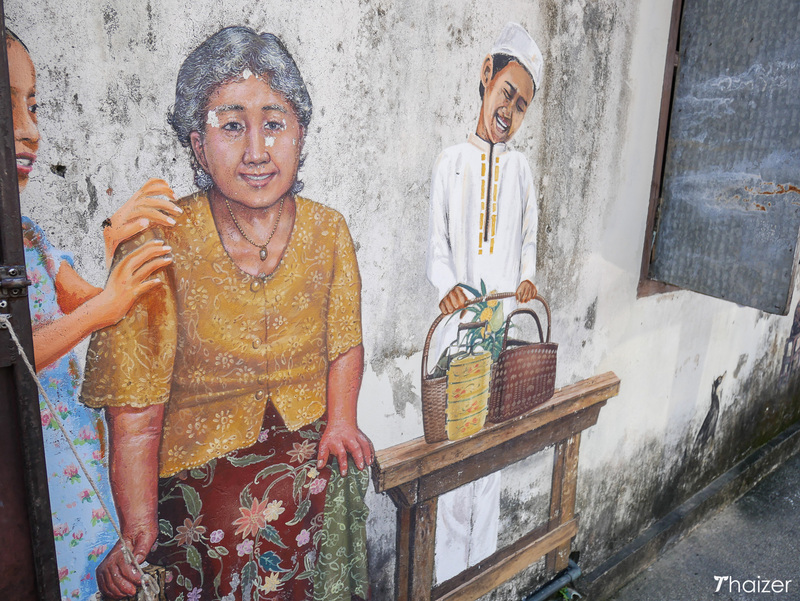 Since the mural was first painted (photo above), a few more ingredients have been added to the scene with the lady now accompanied by a smiling young girl and boy (photo below). 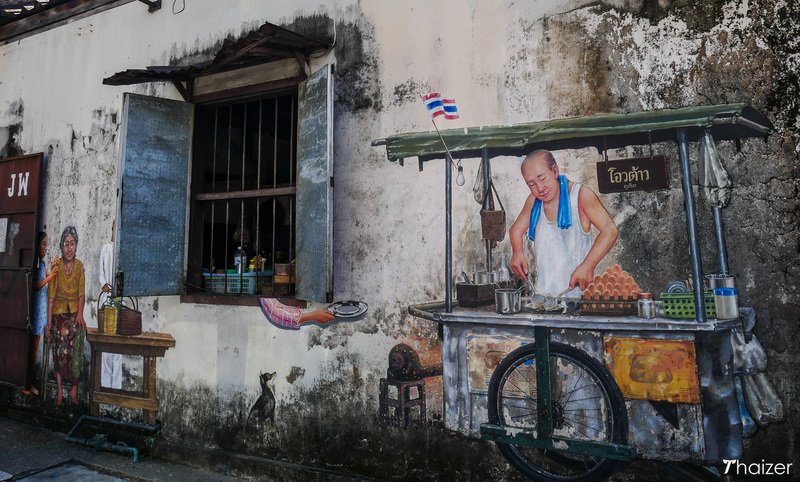 Adjacent to the Home Kitchen painting you will find this image of a Phuket street food vendor. He is depicted frying Oh Tao, a traditional dish for Phuket residents. Made with flour and taro, fried oysters are usually added together with crispy pork and onions. Like the Home Kitchen mural, more details have been added recently with a hand holding a plate in expectation and a small dog looking up in anticipation. In Phuket culture it is customary to offer food, fruits and sweet treats to Chinese deities in return for blessings. In the past, Chinese hand puppet performances would also take place at shrines to entertain the deities. This mural at the entrance to the Shrine of the Serene Light shows a traditional ka-le group of puppeteers. 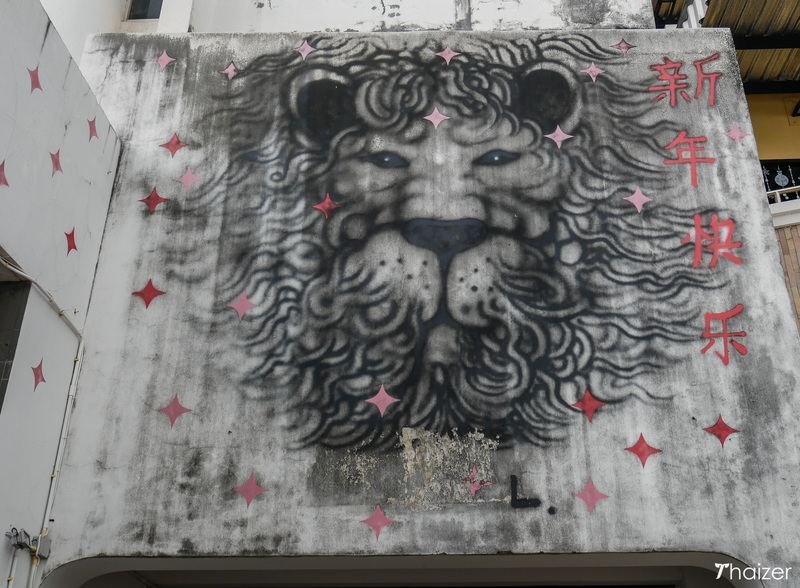 The austere wall above an entrance to a car park is the setting for this painting of a lion which is highlighted with red stars and Chinese writing to wish everybody a happy new year. This collaboration from Liudmila and Lolay depicts Chinese New Year celebrations. Lolay’s distinctive monochrome lion is beautifully complemented by Liudmila’s colourful artwork with splashes of red jumping out from the wall. 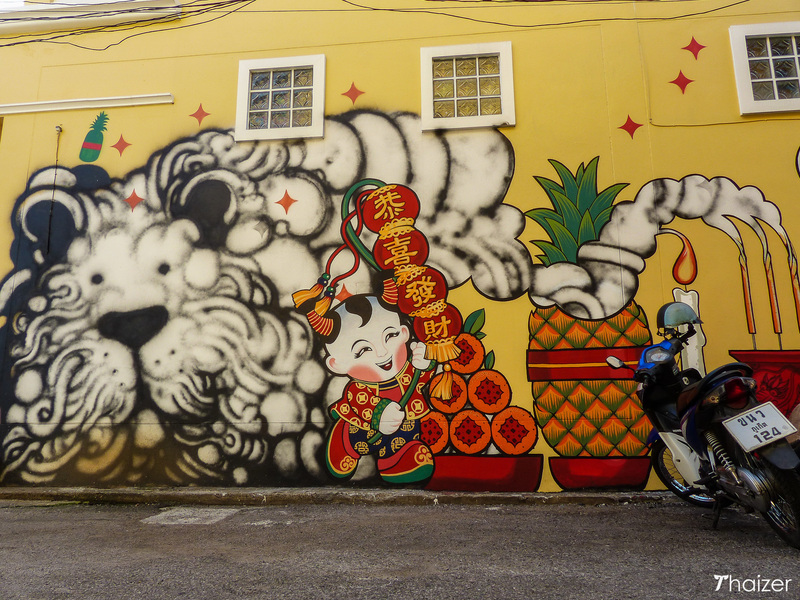 Featuring a lion, lanterns, burning incense, and pineapples, the scene conjures up vivid images of the Chinese Lunar New Year which is widely celebrated in Phuket. Located on the wall opposite the Chinese New Year painting, this giant mural represents what used to be a popular activity of the islanders. The custom would be to have a picnic by the sea and wait to watch the turtles lay their eggs at night. The way in which Phuket island has developed with tourism means that there are now only a few protected areas of the island where the sea turtles still come to shore to lay their eggs. 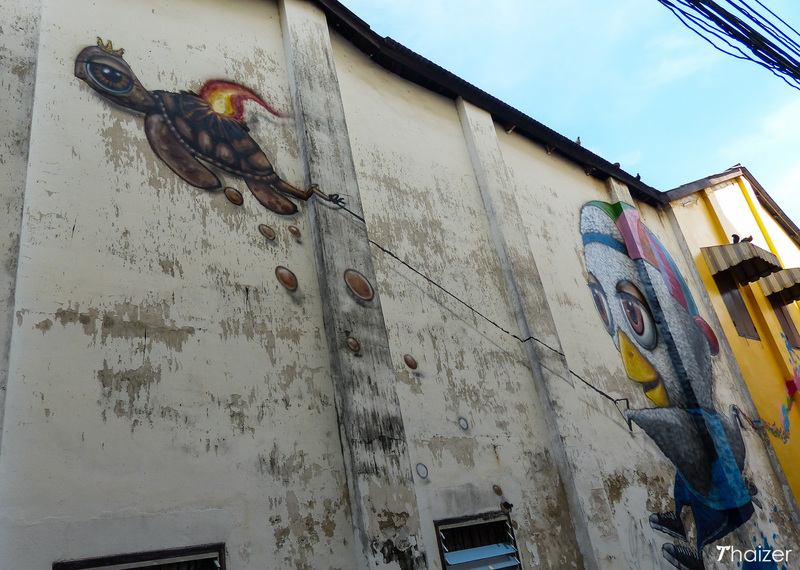 The painting depicts a chick pulling a turtle with one hand and holding a spray paint can with the other. The tiger (some people say lion) in Rakkid’s painting represents the annual Phuket Vegetarian Festival. The animal’s head and body incorporate details relating to the festival with firecrackers, match boxes and lamps. 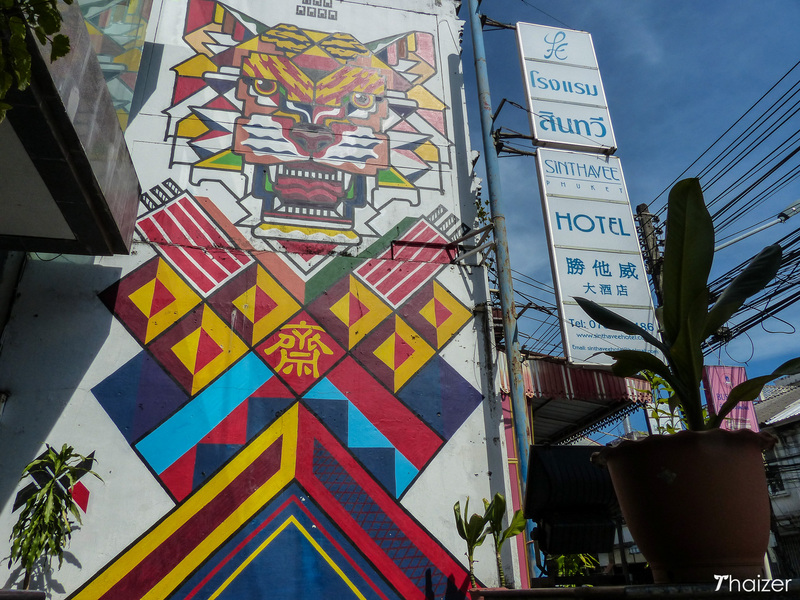 Representing Phuket’s kopi (traditional coffee) culture, the tiger hides representations of coffee drinks and accompanying meals and snacks. In the same parking area opposite the tiger is a small black and white stencil-type design which depicts different kinds of foods presented at a traditional Baba wedding. This includes a caramel candy known as ‘kalamae‘ which signifies a sweet couple sticking together. 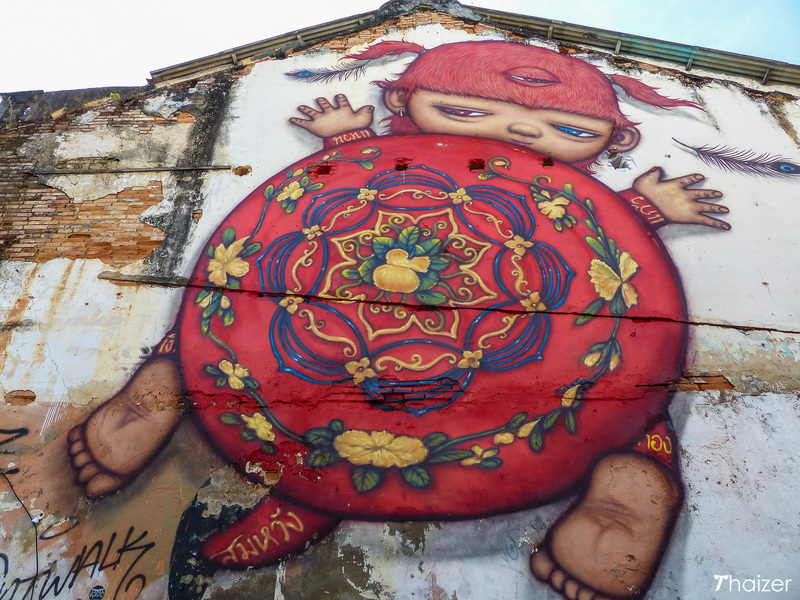 There have been a number of additions to the original street art that was commissioned by FAT Phuket and the So Phuket collective. 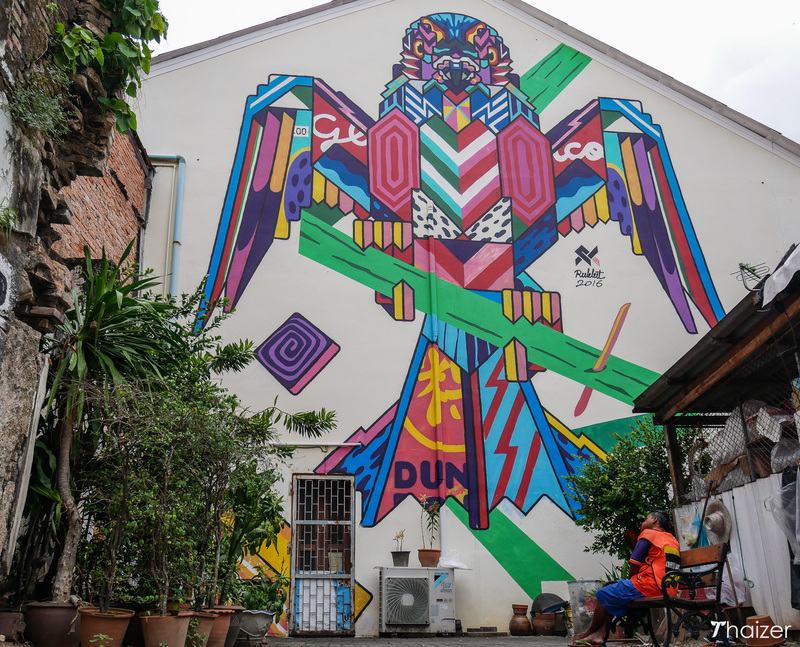 The parking area at Sin Thawee Hotel now has another work by artist P7 which features a monkey. And in the same parking area adjacent to the ‘kin kopi tiger’ is a small painting by artist Charcoal of a hornbill, a bird which can be found in southern Thailand in areas near Phuket. And on Ratsada Road there is a beautiful mural of a lady in Baba dress surrounded by desserts (pictured above). 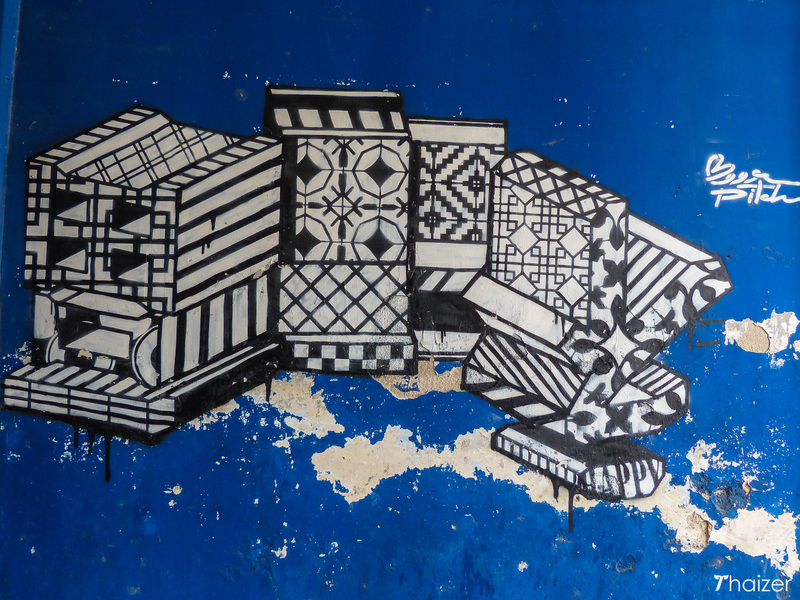 This seems to have been completed at the end of 2017 by artist Pin and can be found in a small alleyway off Ratsada Road. This wall on Dibuk Road was previously covered with a number of different scenes painted by a group of art students and teachers using the collective name 4 Studio. 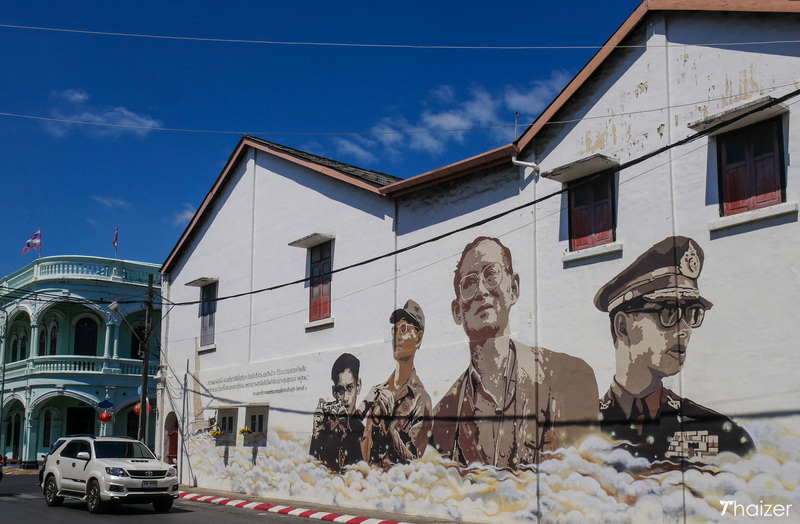 Following the death of Thailand’s much-loved king in October 2016, this powerful new mural replaced the previous pictures. Showing different aspects of the king’s life, the images depict him above the clouds in heaven.